After several years of speculation and a few awesome concept trucks; the 2020 Jeep Gladiator was recently revealed in Los Angeles. The new truck is officially not a Wrangler; but it is a sort of still a Wrangler. All in all, I don’t hate it, but I’m not going to try and convince my wife that we need to order one tomorrow (or in April when they’re available), or really ever. Maybe my opinion will change once I see it in person… or test drive one. 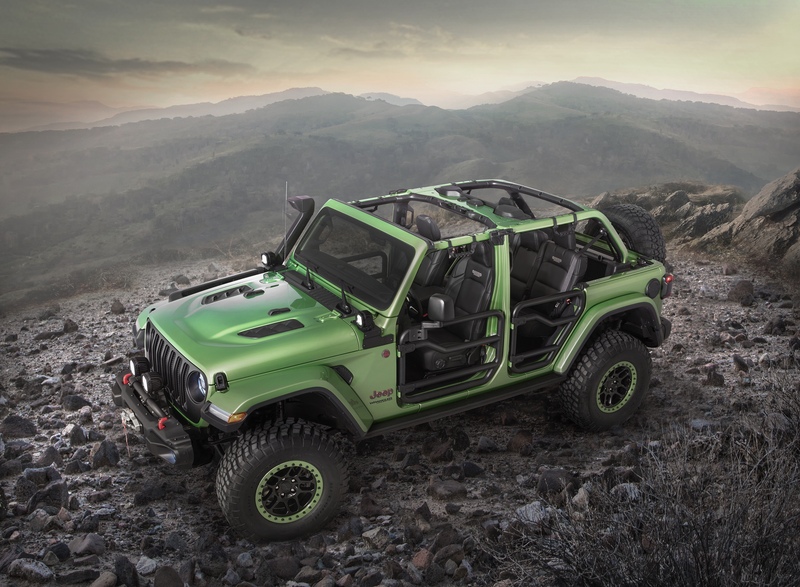 The Gladiator is based on the JL Wrangler, and everything esthetically forward of the rear seat is almost identical between the two vehicles. It may not be close to what I was hoping for, but the Gladiator is more than a Wrangler with a pickup bed. The most important thing to point out is that the Gladiator was designed with a unique frame and are all equipped with next generation front and rear Dana 44 axles. Yes, even the Sport and Sport S will get D44s. (Stands and applauds.) Available in four trim levels (Sport, Sport S, Overland, and Rubicon) with a single cab and bed configuration (all Gladiators will have a crew cab and a 5 ft. bed.) The Gladiator will be available in the spring with the 3.6L V6 and a 6 speed manual transmission or an optional 8 speed automatic. The 3.0L eco diesel will be available in 2020 but only with the automatic… possibly as a 2021 model year vehicle. Four wheel drive is thankfully standard across all trims. Much like the JL Wrangler; the Gladiator will be available with a black soft top, black hard top, or a color matched hard top (on Overland or Rubicon models). Following in the tracks of its JL sibling; the Gladiator’s windshield is foldable, the doors and tops are completely removable – making it the only convertible pickup truck available today. Jeep is advertising the Gladiator as a true truck, with an impressive 1,600 lb payload capacity and available towing up to 7,650 lbs. The payload is only bested by Ford’s new 2019 Ranger with a max payload of 1,860 lbs. A 7,650 lb towing capacity is class leading for a gas V6 4×4 midsize truck. (Chevy Colorado is rated up to 7,000 lb towing for the V6 4×4 Z71, only 5,000 on the ZR2 model, Toyota Tacoma TRD Off Road 4×4 is rated for 6,400, the new Honda Ridgeline is Rated for 5,000, and the 2019 Ford Ranger is Rated for 7,500.) According to a few videos I’ve watched; the Rubicon model will be limited to 7,000 lbs towing which still meets or exceeds its closest competing off-road trucks; the Chevy Colorado Z71 and Toyota Tacoma TRD Off-Road. The Sport with the max tow package will get the leading 7,650 lb. rating. The Rubicon edition Gladiator features a 4:1 transfer case, locking axles, full rock sliders that go to the rear of the bed, front and rear tow hooks, available front steel bumper (the rear steel bumper is standard), and an available front trail camera. The Overland trim is basically the Gladiator’s Sahara Edition; with color match fenders and more luxury options than the Sport or Sport S versions. Overland and Sport models come standard with Jeep’s Command Trac 2 speed transfer case and have an available limited slip rear differential (similar to the Wrangler’s non-Rubicon versions). Again, the Gladiator is a cool truck, and I’m glad Jeep is finally putting one in production; but those rear doors just don’t seem correct to me. I understand the need to utilize existing modeling from the JL Unlimited, but come on… for a truck that is likely going to push close to or exceeding $60,000 (pricing has not yet been revealed)… make actual rear doors for the truck. It looks so great from the front and the back… but I can’t get over the profile view. What I don’t quite understand is the optional removable bluetooth speaker… didn’t they learn anything from the Patriot’s rear dome light flashlight thing? Maybe it’ll work well and be cool, we’re yet to see if it’s more than a gimmick. The Gladiator is focused on cargo hauling (as it should be) and the rear seat configuration emphasizes its cargo and outdoor equipment hauling capabilities… one thing I wish it had (and I may get crap for this as I’m going to compare it to the odd, but well intentioned, Chevy Avalanche) would be a passthrough to the bed from the rear seat area. If the rear of the cab opened up (folded down, was removable with the top and doors) it would give the Gladiator the potential for a full 8ft cargo bed which someone like me would really appreciate. Fold down the rear seat, fold down or remove the rear wall of the tub and boom! Your hauling a few dozen 2x4s with the tailgate closed. I suppose with the top removed, you can certainly extend your bed length into the cab but not as useful as a full passthrough would be. I’m glad the Gladiator is finally here… but I still feel like “Scrambler” would have been a better name. Diehard CJ fans will hate that I’m saying that… but a truck based on a Wrangler, named after a truck that was based on a CJ, just makes more sense than naming it after what was once a full size truck. Here’s hoping a 1500 based J10 is still in the works; but I won’t hold my breath. Jeep has already released over 200 accessories for the Gladiator including lift kits, bike racks, bed drawers, wheels and tires. The payload alone is going to make this an exceptional overlanding rig and I can’t wait to see what the rest of the aftermarket does with it. 2019 Jeep Wrangler MOAB spotted!